Happy Friday, friends! What a week it's been, chez English. While I've been battling my way through the most severe seasonal allergy attack of my life, I've also been reveling in a number of exciting new prospects. To begin, we introduced Huxley to his training potty on Tuesday. He's already used it a few times! Of course, he's also definitely, decidedly, without question NOT used it, too. And so begins that journey. Secondly, in the past few weeks, I've amassed a mini orchard, comprised of: one apple tree, two pear trees, two cherry trees (Bing! YUM! ), two peach trees, and one plum tree. Now, to plant them, and to plant them well. Any suggestions or tips for planting fruit trees as deftly and successfully as imaginable? Lastly, and not to be outdone by toddler potties or mini orchards, my offer for a new book proposal was accepted! I'll tell you more about it as the process unfolds, but, suffice to say, the topic is very, very dear to my heart, and involves something I've been doing and planning and dreaming about since I was, oh, 7 or 8 years old. And you, dear readers, you will love, love, love it! *Roasted strawberry muffins, oh yes! *The idea of single udder butter has me captivated. *A store for the honeybees. *The world is full of goodness when we are grateful. *Handy round-up of online shops with the Earth in mind. *Loving my garden clogs (bought gently used, for $5!). *Pistachio citrus cake-it's not just for pregnant ladies. That image above is from the deck floor of a yome my friends are buying. My buddy Jess's husband, Drew, and his brother built it. Isn't it just lovely? The yome will be my friend's "yome away from home", as they live in Decatur, Georgia but plan to house the yome here in the mountains. We went on a reconnaissance mission for them this past Tuesday, to check on the yome's condition. Turned out we were already connected to the current owner, via a root system network of friends. Ah, don't you just love serendipitous occurrences?! 'Twas mean to be, it would seem! This weekend, so long as I feel up to it, we're hoping to see some friends tomorrow evening (for a surprise birthday party! I ADORE surprises!!!) and then go to this incredible old timey Cake Walk, sponsored by Slow Foods Asheville. Happy sinuses permitted, it should be a glorious weekend. One of my most abiding pleasures in life is finding beauty in unexpected places. Whether that's in the gentle sway of laundry drying on the line, the cascade of leaves from a ginkgo tree, or the camouflage print on a toad's back (Huxley and I found an incredible specimen hiding out in the mint patch by the front door! ), discovering the innate exquisiteness in nature is so very fulfilling. Which is why I was so happy to realize just how gorgeous collard bolts are in a vase. Who knew, right? Hubs is the party truly responsible for this revelation. I'd been trying as much as possible to pull off the flowers from the collards in the garden (planted last September and still going strong owing to our incredibly mild winter!) all spring, so as to prolong their life span. Then I got busy with writing-projects and baby-watching and, well, life, then it rained, and the flowers went bananas. We began noticing just how much the pollinators of every persuasion out here in the cove seemed to love the flowers, so we opted to let them be, for now, at least. Hubs got curious about what one could do with the flowers (aside from sharing them with those buzzing beauties), and brought a handful inside. I put the blooms in water until we decided what we might do with them and realized, suddenly, that they were perfect just like that. For Jen's potluck dinner, we placed a vase of the blooms on the feasting table. They served as a perfect compliment, and nod to, the southern bounty of foods it adorned. I'd have never have imagined I'd be tricking out my dining room table with collard blooms. And now, well now I can't imagine not doing it! For those who've mentioned it, you can see many more images of our old window cold frame, and read about how we made it, here. We use a lot of matches, chez English. There's the usual suspects, like starting the wood stove, that require us to strike a match. There's the gas range, which we light with matches, too. There's also the fire pit outside, and the grill on the porch. There are an abundance of candles and incense, as well, which I'm particularly fond of firing up. Finally, we employ them regularly in the bathroom, where they make a fabulous, inexpensive, low-fi odor eliminator, when the "need" arises (you know what I'm saying here, right?). Several years ago, I came across some gorgeous, artfully designed match boxes at a store selling lovely bath salts, candles, soaps, incense, fluffy robes, and an array of in-store spa therapies. They had seed pods and unusual flowers on them and long matches inside. I was taken by the packaging and purchased a few boxes. Those pretty little parcels ran out not too long ago. A stickler for nice-looking items, whether utilitarian or purely ornamental, I longed for those boxes again, but hesitated over their price. Enter the incredibly easy, ridiculously affordable solution. A few images, a box cutter, and some adhesive later, and I'm back in the decorative match box business, for considerably less money. This is an ideal opportunity for using magazine pages. After you've read it, and decided you're ready to pass it on or recycle it, look it over for any graphic images. We used pictures of quilts in the match boxes above. It could be an artful image, a vivid color, a graphic pattern used in an ad-anything, really, that speaks to you. Carefully cut the image to fit the top of your match box. We like to use the large size Diamond brand "Greenlight" matches, which are sourced from responsibly managed forests. Each box holds 300 large kitchen matches, crafted "extra thick for longer burn time." Perfection! This project couldn't be any easier, or any more simultaneously useful. Just because an object serves a super utilitarian function doesn't mean it shouldn't also be pleasing to look at. In fact, I'd argue that it should then definitely be easy on the eyes, by virtue of the fact that you'll be looking at it so often. Next time you find yourself using matches, consider dolling them up similarly. Save yourself some cash while making your life a little more atractive. We picked up a few new eating implements for Huxley recently, as his robust appetite had been resulting in a shortage of clean bowls and plates at the ready. Green Toys recently launched a new line called Green Eats. Our local natural home supply store, Nest, had a 4-pack of their plates for sale, all made from 100% recycled BPA-free plastic. Green Toys makes some seriously fantastic products, including the race car and dump truck pictured alongside the plates, Nugget-warming and 1-year birthday gifts respectively for Huxley from some loving friends. They're incredibly durable (perfect for an active toddler with tiny fists and biceps of steel-I tell ya, the little guy is STRONG! ), come in a variety of eye-pleasing colors, and support a small business doing a good thing. I'm a fan, all around. Also at Nest, we found a Bambu toddler plate and spork. Bambu makes a line of beautiful, contemporary products for the home from an imminently renewable resource, bamboo. We use a number of their other items around the house, and always keep a travel spork with us, should a to-go meal requiring utensils suddenly occur. I'm always interested in learning about great, sustainable kid's companies. If you know of one that you're particularly smitten with, I'd love to hear about it! I'm gearing up to teach another of my "Backyard Chickens" classes at our local community college, AB-Tech, tonight (there's still a few spaces left, if any of you want to come!). Accordingly, I've got chickens on the brain. This time of year is such a great time in the wide world of our fine feathered friends. Their plumage is nice and glossy, their combs and wattles are red and plump, they're thrilled to be finding bugs available for the picking (pecking? ), and some hens are going broody, ready to sit on a clutch of eggs. In short, the birds are living the good life! When my flock is happy, I'm happy. As such, I'd like to offer one small measure reader a copy of my book, Keeping Chickens. I'm also including with the book a couple of brown ceramic eggs. More than simply decorative objects (if you're into the whole poultry decor thing, that is), these eggs are incredibly handy to have around, for a variety of reasons. Should you have a hen go broody, but don't have a rooster in your flock (and therefore lack any fertile eggs), you can tuck these eggs under her. She can then continue to sit without doing so on eggs you'd rather be consuming yourself (that is, unless you want to discourage her broodiness, in which case you'll need to block entry to the nesting box she's been using). These ceramic eggs can also be used should you ever have a problem with a member of your flock eating their own eggs. An attempted peck or two at the fake eggs is pretty much all it takes to discourage the nibbling interloper from continued action. To enter the giveaway, simply leave a comment below. Be sure to leave a means of contacting you in your reply, either via your email address or through a link back to your own blog or website. I'll run the giveaway through next Wednesday, April 18th, midnight EST. The giveaway is open to all residents of North America. Whether you're already a chicken tender(er), or hoping to get a wing up on the venture this year, here's wishing you and your flock a world of food and fun! 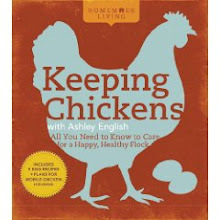 UPDATE:The winner of my "Keeping Chickens" book and ceramic eggs giveaway is lucky #62, Sarah, of Frugal By Choice. Thank you so very much to everyone that entered, and props to you, Sarah! Today I'm beyond excited to introduce to you a new twist here on small measure. You've all heard me talk about this thing Hubs built, or that dish he cooked, but you've never heard him bring it to you himself. Well, no more. Debuting today is the first of, hopefully, many more musings from the man himself. He's been so taken with morel hunting, and general forest explorations, he wanted to share a bit of what he's gleaned on his walks with you. His most recent cache is pictured above. Last night he served Huxley and I an exquisite dinner of grass-fed beef topped with lemon balm compound butter (using leaves gathered from our plants), grilled asparagus (from nearby Hickory Nut Gap Farm) and Yukon potato slices, and morels served in the traditional style-dredged in flour and fried to perfection in butter. We all groaned and moaned in delight; Huxley even offered up his highest compliment-"'Licious! "-completely unprompted. Ashley, Huxley, and I are very fortunate to live in a quiet, majestic clearing in the woods, nestled in the verdant mountains of Western North Carolina, part of the oldest mountain range in the world. This area is the only temperate rain forest in North America, outside of the Pacific North West, and because of all that moisture, along with the varying elevations and proximity between north and south, one study found it to be the most biodiverse region in North America. I don't know if that's true or not, but there is certainly no shortage of beauty and wonder in these woods. A walk in the woods always makes me feel particularly alive, and it seems that every time I venture out into the woods, I feel a little more connected to nature. It takes some patience to walk in the woods with me, because every few steps, another natural wonder, be it a stone with an unusual shape or patina, or a plant with leaves of curious geometries, or a color creature slinking across the path diverts my attention. It awakens my senses like nothing else, and the experience is both wondrous and dreamlike. I'm not a religious man, but I suppose in a sense, the woods are my church. That's why I was particularly amazed to find that hunting for morels brought the experience to a whole new level. Not that there is anything wrong with a glorious, aimless walk through the woods, but I found that something truly remarkable, and profoundly connecting, happens when my attention is focused on the goal of finding those gastronomical gems that nature has cleverly hidden in the subtlest of nooks and crannies of the forest. I would have guessed that a walk through the woods with such keen intention would come at the expense of stopping to smell the flowers, and noticing the magical details that usually catch my attention, but as it turns out, nothing could be farther from the truth. In fact, it focused my attention on details that normally would have been glossed over by the vastness of information all around, like the subtle difference in the patterns of bark between a big old oak and a tulip poplar, or the shock absorbing crunch of decaying organic matter that has built up in one area, verses the springy bounce of moss on another. I would also have guessed that I'd be so focused on the forest floor, I would barely notice what was in front of me, or what was above me, but quite the opposite has proven true. Morels grow best under certain conditions, like dead elm trees, or large old grandfather poplars, or trees that are slowly dying. In the early spring, when the leaves aren't all the way out yet, telling one from another often means a lot of careful attention directed up to the tops of trees, which leads to all sorts of other wonderful sightings, like reticulated woodpeckers and curious dendritic patterns where lightening or storm changed the angle of a tree that responded by growing back in an unexpected, determined direction. One of the most interesting things is that it forces you to start noticing which plants grow next to each other The more you start picking up on those patterns, the more you start to develop an eye for where to find them. When you stop and really notice those patterns, of trees, of ground cover, of soil, of light, you start to have a much better sense of where to look, and your success rate increases exponentially. I won't lie, it's frustrating at times, when despite your best efforts, you just can't seem to locate any of those sneaky morsels. But when you do find one, that makes it all the more exciting. It's like winning the mushroom lottery every time. For me at least, it's impossible not to feel thrilled every single time I spot one. But in truth, even those times when I come back empty-handed are rewarding in unexpected ways. Forcing myself to pay attention like never before always leads to new discoveries, like ferns pushing up through an old stone chimney that was all that was left of a house in the woods reclaimed by nature more than a century ago, fort-like little worlds under the rhododendron canopy, or a spring dripping down onto rose quartz from the moss covered roots of an old tree in the side of the ridge, looking like it came straight out of a faerie tale. No doubt, this is going to be something that I look forward to every year. I suspect that over time, as I learn to be more in touch with nature's patterns, I'll get better and better at returning home with a treasure of spoils. I already know that, find them or not, I've learned so much I'll be taking with me whenever I venture into the woods, no matter what time of year. I'm so excited to be working on a redesign of small measure with my buddy, Alisa of Lucky Design 7 (she's the genius behind the blog banner above). 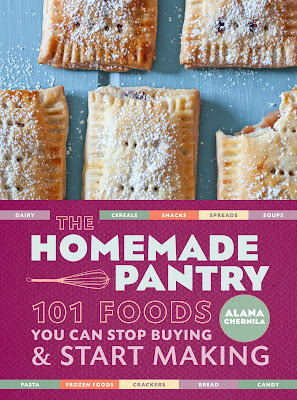 It's slated to launch sometime in early summer, in advance of my new book (which publishes August 7th). Alisa has been sending me images and mock-ups of the new site and, FRIENDS! You're going to love it. I guarantee it. Part of the new look will involve a selection of sponsorship spots. If you've got a business you think would be a good fit for small measure readers, I'd love to chat with you. My rates are really reasonable and will be available in several sizes. So, if you've got an idea, hit me up at: ashleyadamsenglish(at)gmail(dot)com. Let's hook our wagons together and shoot for the stars! Today chez English we feasted on Asparagus & Feta Quiche (the recipe's in here! ), my "cleaned up" version of the southern fruit salad known as Ambrosia, and Ree Drummond's Hot Cross Buns (with homemade candied orange peel and currants tucked inside). Huxley plundered brightly colored eggs, courtesy of his great-grandmother, after which we gorged on seasonal peppermint creme, coconut creme and peanut butter-filled chocolate chicks from my most beloved chocolatiers. Bellies and hearts are full, another Easter enjoyed in the company of those I hold so very dear. May your day be equally filled with love, laughter and abundance. Happy Friday, friends! This has been a good week around here. Lots of new, fun, exciting writing and other projects are in the works. We've also had (as it's said around here) a "mess" of rain, which I always gladly welcome (as will Huxley-he's mad about mud puddles, yelling both "fast" and "run" as he gallops through them!). *Wheat grass monograms-such an easy, fun, all-natural crafting idea. *Adorable, sturdy kitchenware for the littles (thanks to Amanda for the tip). *Kim's "Locally Known" farm photo series is stunning! *Here's what you can do with any leftover 2011 fruit preserves. *Eggs, eggs, and mo' eggs. *Homemade citrus liqueurs! And limoncello, too! *If Camille can make challah in an outdoor grill, so can you. *I'm making hot cross buns this weekend. Still deciding between these and these. *Great tutorial on how to break down a whole chicken. Two books in my Homemade Living series received some love this week. 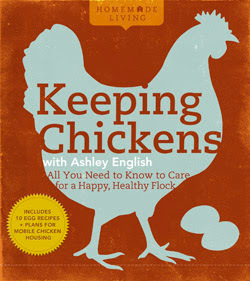 Kitchen retailer Williams-Sonoma debuted their Agrarian line, and included my book Keeping Chickens in the mix. 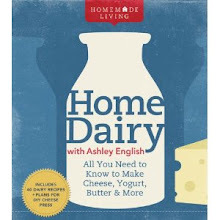 Also, Epicurious contributing writer Megan Steintrager included tips from me (and my Home Dairy book) in her post on making homemade yogurt. I'm excited to meet up with my editor and buddy Nicole for a cocktail later today (we're going to The Junction-have you been? Nicole loves it). 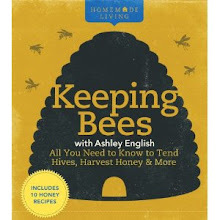 Jenny is coming over tomorrow to chat about bees (we're making splits from my abundant hives!) and otherwise catch up. Sunday will have us spending time with family and seeing if Huxley gets the whole "hide eggs in the yard and go find them" scenario. I mentioned last week that I've been busy doing a good deal of freelance writing lately. 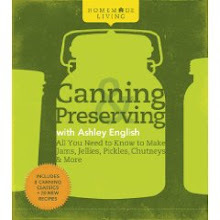 One of those new gigs is for Mrs. Wages, a purveyor of canning products. The way I came to write for Mrs. Wages is, to me, an example of the best part about blogging, and the community that doing so engenders. A few weeks ago Marisa of Food In Jars sent me an email, giving me a head's up that Mrs. Wages was looking for a new columnist for their monthly newsletter. Marisa pens her own column for the company, where she blogs recipes and tips for canning seasonal foods. When they mentioned they were on the hunt for someone to blog about seasonal pie-making, she sent them my way, knowing I've been all kinds of busy with pie this's and that's for the past year. And so, it's my pleasure to share with you today my first post for Mrs. Wages. Each month, I'll offer recipes for rendering pies out of the freshest seasonal offerings. For my first post, I made a scrumptious, oh-so-spring Lamb, Pea & Herb Pot Pie, as well as a creamy, dreamy, delectable Rhubarb Custard Pie. 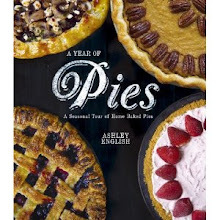 You can find the recipes for both here and see photos of each pie above. Thank you, Marisa, for thinking of me. And huge thanks also to Liz, my connection at Mrs. Wages, for bringing me into the fold! Oh, one last thing. While I'm bursting with gratitude and gushing over blogging and connections and community, I should mention that my monthly "English Lessons" post for Verve discusses this very thing! Pie and community. It doesn't get much better than that!